Whether you make candy recipes just for fun or to keep your children from eating the less wholesome commercial candy you will want to make good candy. Many people have turned their love for making candy into a profit making business. Can you believe that until the nineteenth century, the art of making this kind of sweets was practiced chiefly by physicians and apothecaries to conceal the taste of medicines. In earlier civilizations sweets were supplies by natural sources such as honey and saps from the trees. The convenience of processed sugar has caused homemade candy making to explode. Having the proper equipment for your candy recipes adds to the pleasure of candy making and to the success. As you know, I am not a fanatic when it comes to equipment. I know many people cannot afford to run out and buy all kinds of equipment. I am not a professional candy maker but my idea is to get people started and try to use what is available if possible. In candy making, the one exception for me is a candy thermometer. They are very cheap to purchase and very important for successful candy. The temperature for which syrup is cooked decides the type of candy so the temperature needs to be exact. Other equipment needed includes heavy saucepans which most can use what is on hand. Wooden spoons or wooden paddles are nice for stirring, but honestly I have used large metal spoons and never had a problem. You will also need some type of candy pans or something in which to cool the candy. Before I had many pans I cooled fudge on dinner plates. Many people would not be without a large marble slab, but I still do not have one; I use large platters. Of course if you really get into making candy recipes, there is so much more equipment you might like to purchase. In addition to the previously mentioned items you might want to add to your candy making equipment some inexpensive items. A broad kitchen spatula is for working with fondant. A medicine dropper is convenient for adding acid and flavoring oils. If you do not already have pastry brushes, they are great for oiling pans, slabs and distributing water evenly. Kitchen scissors are helpful in cutting candies like taffies and wax paper is needed to wrap taffy, caramels and others in. Also you might want a wooden cutting board kept just for cutting your candy on. If you decide to do candy making on a large scale, you will need some additional equipment to make your job easier. 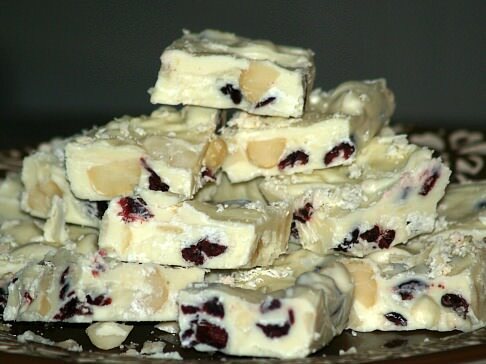 A large marble slab is the best working surface for beating fondants and fudges, pouring caramels, brittles, butter toffee and hard candies, as well as dipping chocolates. 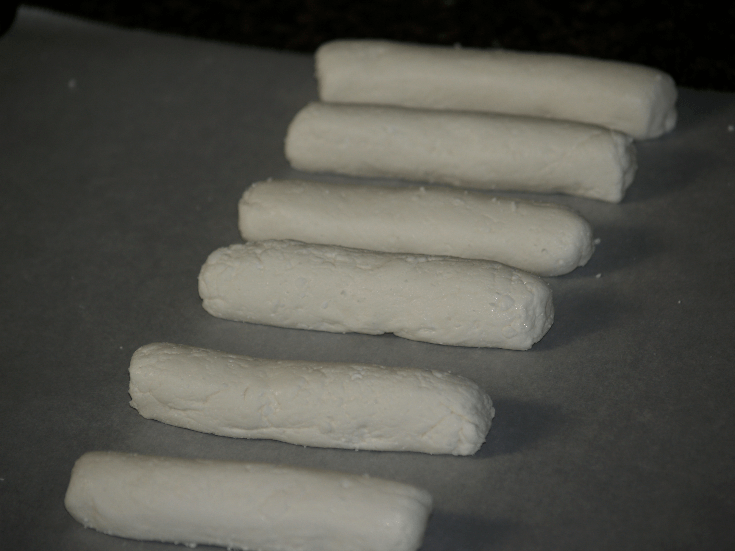 Have several dipping forks for coating bonbons and nougats. Candy irons regulate the thickness and size of a batch of candy poured out. 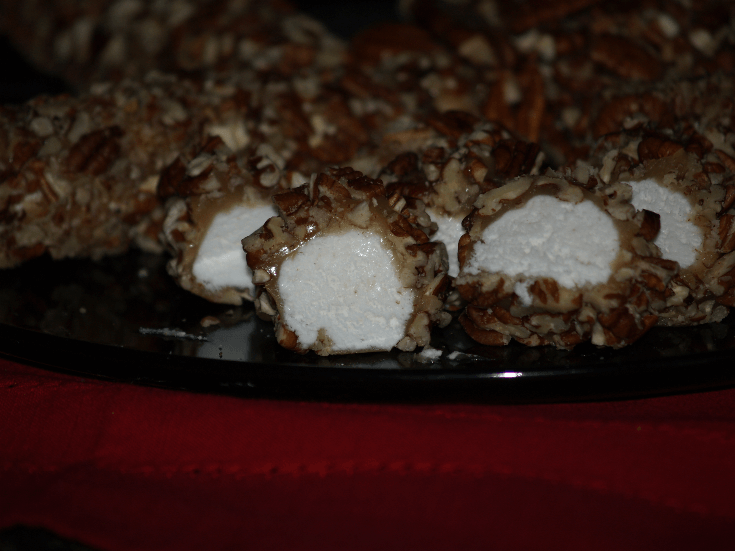 I want to share with you my favorite candy recipes that I have made for Christmas for many years. 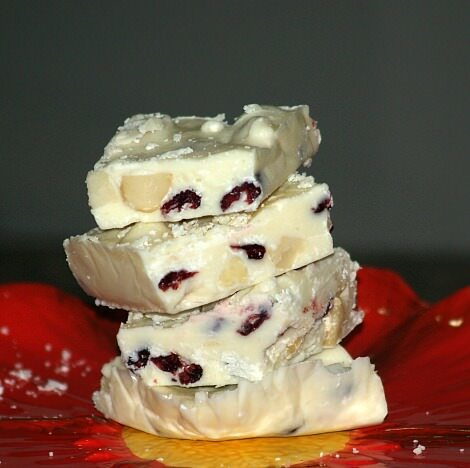 The first one is a hard tack candy recipe. This is special to me because we always had hard tack candy for Christmas when I was a child. We never had much candy throughout the year like children do today. On Christmas morning there were bowls of candy and fruit under our tree. Hard tack candy was always there. There is nothing that smells any better cooking in your kitchen than this candy flavored with peppermint, licorice or many other delicious oils. When I started making this candy many years ago, the oil could only be purchased from the drug store. Now it is available in all craft stores or the craft section of department stores. Mix together the sugar, corn syrup, salt and water. Cover and bring to a boil. Remove cover and cook over medium heat until candy thermometer reaches 290F degrees. Remove from heat and work quickly adding the oil flavoring and coloring. Pour into oiled pan but do not scrape from your cooking pan. Let cool until a heavy scum forms on the top. Cut slightly with a sharp knife but do not break the scum. When it gets solid and cools slightly (but still warm) turn out onto a board and tap lightly to break into pieces. I have two coconut balls recipes which are special to me. The following candy recipe is the one I use to make for my dad because he loved coconut so much. The other recipe is from my sister Shirley. Both of these candies are delicious. Combine the coconut, sugar, almond and mashed potatoes. Refrigerate until a little firm Roll into 1 inch balls and dip into melted chocolate. 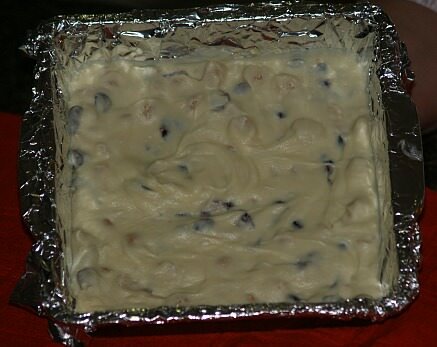 Line 9 inch square pan with foil so foil extends over sides of pan; butter foil. In a large saucepan combine sugar, butter and milk; bring to a boil stirring constantly. Continue boiling 5 minutes over medium heat stirring constantly. Remove mixture from heat; add marshmallow cream and chocolate chips and blend until smooth. 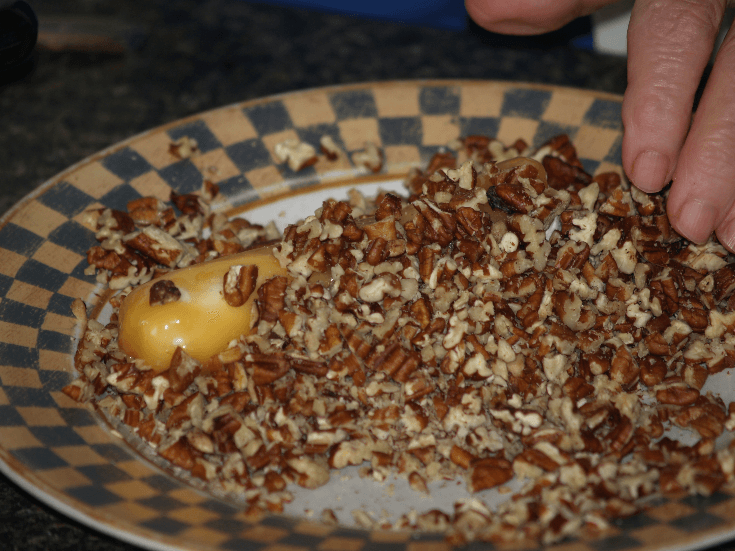 Stir in walnuts and vanilla; pour into prepared pan. Cool to room temperature; refrigerate until firm. Remove fudge from pan by lifting foil; remove foil from fudge. Cut into squares; store in refrigerate. Makes about 3 pounds. 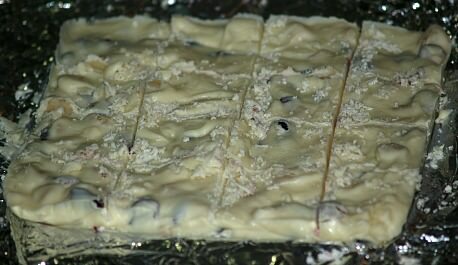 Melt white almond bark, unsweetened chocolate and chocolate chips in crock pot or double boiler. Add dry roasted peanuts; stir until coated. Combine in a heavy pan the sugar, corn syrup, salt, persimmon and evaporated milk. Cook mixture about 32 minutes to a hard ball stage (about 255F degrees) over medium heat stirring. Blend in vanilla and butter; set aside to cool. Beat mixture until it becomes dull; add nuts. Pour into 9X12 inch greased pan; let stand until firm (At least 12 hours. Cut into 1 inch squares; makes 70 pieces. Line a 8 inch square pan with foil; press down to make it smooth. Melt coating in a saucepan over medium low heat stirring until smooth. Add nuts and cranberries; mix until blended. Cool completely and cut into pieces. Shape into SIX 4 ½ X1 ¼ inch logs; chill overnight. 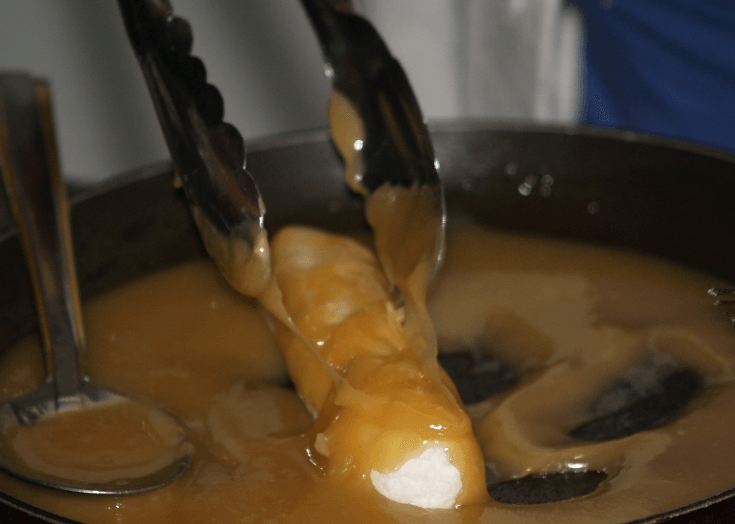 In top of double boiler over boiling water stir caramels and water until smooth. 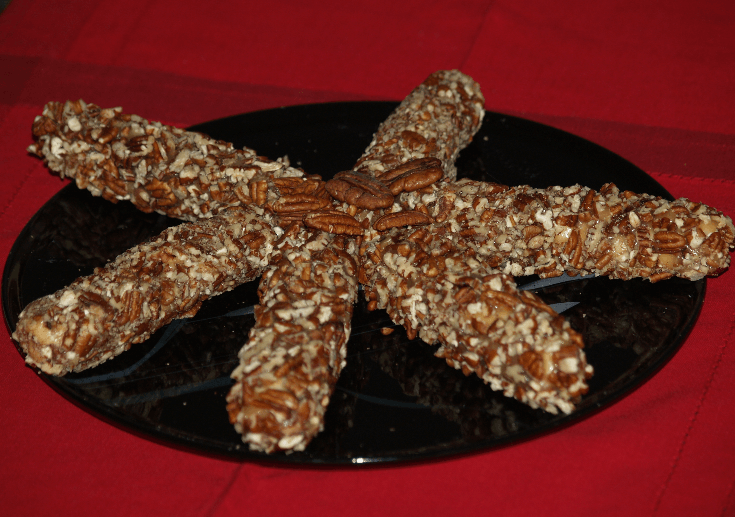 Dip logs into caramel, then roll in pecans; chill for at least 2 hours. Cut into 1/3 inch slices; makes about 6 ½ dozens.